Darwinia contest is hardest than ever before! I think performance without experience is just luck. BTW we are repeating the same stuff. We have alredy one topic for Darwinia and one topic for Experience, writing the same thing on a third topic is useless. I thought that the subject was rating of january 2018. Darwinia is designed to prize good traders, not to avoid prizing some luck. If you deserve to be prized, you are prized. Yes, personaly D-Score menas nothing. You can see many 60+- D-Score darwins losing money...Just being an old Darwin with mediocre or even bad results (losing money) have high D-Score and just for that reason with one good month rank high in Darwinia...not fair. Example> VLS has had negative return almost since inception during one and a half year UNTIL TODAY, and it is right now in Darwinia 4th place with a 5% of return this month. And it is not an exception, it happens every single month. This is his underlying strategy...not better. But, at the same time I have to say that Darwinex overall work is excellent... but they should work on Darwinia to be fairer. ZZI was No. 17 in January 2018. You are right. But the topic of this post is "Darwinia contest is hardest than ever before!" .... so every place in the contest that goes to a darwin that everybody knows doesn't deserve it, is a place "stolen" to a darwin that instead should be rewarded. "Darwinia contest is hardest than ever before!" We have already 2 other topics to criticise the criteria. There is no need to repeat 10 times the same things. Contest is harder because traders are better than before not because someone has been prized once for a lucky month. Nobody has been stolen, there is an excess of prizes, when someone deserves to be prized it is prized. Just humor me CavaliereVerde, but if darwinia is hardest than ever, giving prizes to darwin like ZZI is a use of resources not well allocated. Should be Darwin first to act and change something. And ZZI is not alone. Chapeau...no more questions your honor! I encourage you to focus on the DARWINS that have larger allocations instead of the smaller exceptions, looking at the big picture is usually a better way to judge a situation. The idea behind DarwinIA is to attract the best traders to Darwinex and, believe it or not, the fact that good traders are commonly allocated funds has more weight than the fact that a non-good trader can make it to the top 48 every so often if they yield 20% in a given month! Ignacio, we agree (at least I do) Darwinex is making an overall incredible work. I am personally very satisfied with the whole stuff with you guys. However, it doesn't mean there are some things to improve. And we (traders and investors) as a part of this big family have to point what we think you can do better. And Darwinia is a important part of Darwinex success. So, if it is true most top 48 darwins deserve to be there, also it is true every month is someone that doesn't belong to that list. Thanks for the feedback, @Forexintradiadarwin! Of course, there are things that can be improved (we are on it), but I am sure that aspiring traders also like to get their prize every so often (especially if they make 20% in a month with a 10% VaR, which is pretty hard!). On top of having a good month, ZZI has managed to stay "alive" for a whole year. Both you and @GAlbano76 will be competing for DarwinIA prizes as soon as your experience grows to 10 and when you get there, I am pretty sure you guys will love the way the system works (nothing would make me happier than seeing you get a DarwinIA prize!). That being said, I do hear you!!! The philosophy of Darwinia is that a good month can be the beginning of a profitable trackerecord, look to GED for example. Return is just the past, DScore is more leading, Darwinia is even more leading. Prizing short trackrecords would be worse that prizing a survivor with a good month. How prizing short trackrecords with 3 good averaged months would be worse than prizing a survivor with a good month? And why being a survivor has to be rewarded? Survivors are just survivors or "all dinosaurs"as I call them. A good trader is not only a survivor, it needs performance with or without a good D-Score (because there are plenty of "all dinosaurs" losing return holding 50-60 D-Score) and with or experience. Just results in a reasonable period of time matter. Rewarding survivors with one lucky month doesn't make sense to me. if we just discuss long enough the probleme will solve itself because of more and more importance of Dscore you wont be able to get a good rank without a good Pf, after all a trader with a good Pf is someone with profit measured for this time period (~1 year). I have to pay taxes for P/L the end of the year, they wont ask me if it was just luck in dezember. 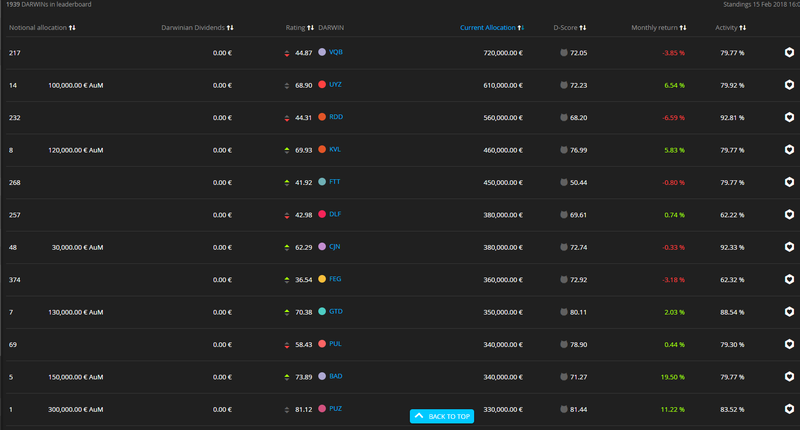 Woowwwww...today is March 30th, Darwinia is over and when I see the ranking...it is hard to see Darwin EWL has obtained $1000 in dividends and 130.000 AUM just because he had three extraordinary lucky days (March 26th to 29th)! The message it is giving me is, open 10 accounts, when they become darwins go crazy using some martingale system, because a couple or three will make a home run and they will go on top of Darwinia, from there on, trade well on them so you make money on top of investment. Is it the Darwinia spirit? If it only was that easy ... if a trader is able to "trade well" why not just do this from the start instead of messing with the track record using martingale? It's not against the rules to do that, so I would encourage you to try it but I have my doubts that this a profitable strategy. I am against those systems, that´s why I am so critic with the current criteria. But it looks like it is working well for some traders...uh? But it looks like it is working well for some traders...uh? name a couple. It's just not true that the system is rewarding martingales. It's a very tough job to rate a trading strategy based on trading history alone (even more so if you don't have enough history). Of course, there will be wrongly rated Darwins in the leaderboard from time to time. But even with a comparably easy text recognition task, you won't achieve 100% accuracy.